"Exposure of the Corpse" is the practice of placing the body of the deceased in an open area instead of using coffins or sarcophagi. In the Indian tradition, the practice of exposing the corpse included putting the body in the forest or sinking it under water. Originating from India, medieval Chinese monks also practiced exposing the corpse in the woods but so far no textual evidence support the practice of water burial. In addition, cave burial (Shishi yiku 石室瘞窟) was also a type of Lushizang in medieval China. Starting from the third century CE, Chinese monks used caves as the resting place for the deceased. This funeral practice may have been influenced by Central Asian practices. Compared to forest burial, cave burial was less direct than exposure. To achieve the goal of giving one's body to the animals, most caves and grottos were open. The few exceptions include the north cliff of Longmen wanfo gou (龙门万佛沟). Generally, monks used the sitting position and practiced dhuta (Toutuo 头陀). These caves were reusable and most of them were found in Chang'an and Longmen. Dunhuang and Sichuan also have such caves. Chinese monks began the practice of "forest burial" from the fifth century CE. Reputedly the famous monk of the Eastern Jin, Huiyuan, was the first in China to practice forest burial. This practice might have been very popular in the sixth century CE. According to the Book of Chen (陈书), even lay people attempted to adopt this funerary method. The term “Cool Grove” (Shituolin 尸陀林) was applied to describe the exposing place, or used as a general term for this practice. 1 2 3 4 Kariyawasam (1995), ch. 5, "Almsgiving and Funerals." ↑ Malaysia Buddhist Co-operative Society Berhad. "A Guide to a Proper Buddhist Funeral" (PDF). 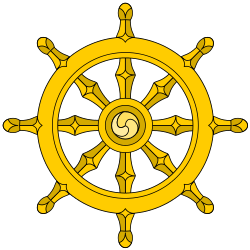 Buddha Dharma Education Association Inc. Archived from the original (PDF) on January 24, 2014. Retrieved 14 October 2008. ↑ BuddhaNet. "Ceremonies and Funeral Rites for the Dead". Retrieved 14 October 2008. ↑ Kuew, Shin Shie. "The Sacred and the Profane: Contemporary Development of Funeral Rituals in Taiwan from the Perspective of Buddhist Funeral Rites Reform". Retrieved 14 October 2008. ↑ Yagi, D. K. (1988). "Protestant Perspectives on Ancestor Worship in Japanese Buddhism : The Funeral and the Buddhist Altar". Buddhist-Christian Studies. 15 (1): 16–37. ↑ See also, for example, in the Pali Canon, awareness of another's death is often referred to as one of the "messengers" from the lord of the Underworld meant to spur one onto a more wholesome life. ↑ D ii 157; D ii 199; Ja i.392; Ap i.64; Ap ii.385 (retrieved 2010-12-14 from "Bodhgaya News" at http://www.bodhgayanews.net/pitakaresults.php?title=&start=0&to=10&searchstring=v%C5%ABpasamo%20sukho). ↑ Khp 7 (trans. Thanissaro, 1994). ↑ Khp. 7, Tirokuḍḍa Sutta, vv. 7, 8 (retrieved 2008-09-04 from "Bodhgaya News" at "Archived copy". Archived from the original on 2009-03-19. Retrieved 2008-09-04. and http://www.bodhgayanews.net/tipitaka.php?title=&record=8017, respectively). 1 2 Harvey (1990), p. 212. ↑ http://www.ah.gov.cn/cjfw/ahly/showcontent.asp?newsid=%7B1E8B86BC-DF96-496B-B70A-8F414E92E82B%7D Archived April 29, 2008, at the Wayback Machine.